If Debora Juarez slammed the door any harder Thursday, she would have joined Mariners pitchers Felix Hernandez and Hisashi Iwakuma on the 60-day disabled list with messed-up shoulders. The Seattle City Council member spent more than three hours chairing a meeting of the Select Committee on Civic Arenas — a small misnomer because it should be singular, not plural — and was tired, hungry and in no mood to re-consider an idea, the proposed arena in Sodo, that threatened the project she had just helped advance. “I voted on that 18 months ago and voted no. It’s done. It’s over,” she said, speaking firmly of the council’s May 2016 vote of 5-4 that denied the Sodo project a street vacation. “I’m looking forward. That’s a failed MOU. With that, she looked at reporters and said, “Anything else?” in a tone that suggested she wasn’t serious about further interrogation, turned and walked out of council chambers. Dikembe Mutombo is a little taller, but he couldn’t have swatted away developer Chris Hansen’s shot more forcefully. Juarez and four other council members voted unanimously to advance a draft memorandum of understanding to a full council vote Dec. 4 on a proposed $660 million do-over of the 55-year-old Key Arena by the Oak View Group of Los Angeles. Approval is expected. The step Thursday was not a final green light for the MOU. But the meeting would have been an opportunity for the independent consultants or council members with serious concerns about the financing, design or impacts of the project to make them known publicly. That easily could be construed as the granting of a street vacation for Hansen’s project, which OVG appeared to see, at minimum, a complication, and more likely a direct threat. Juarez claimed she was unaware of source of the proposed amendment. If that were true, then why bother? The council voted unanimously to take no action on adopting the amendment, quietly and bureaucratically slipping the shiv to five years of work by Hansen’s team. Thwarting Hansen’s revised, all-private proposal at the committee level is a convenient way to clear the way for the party Dec. 4 — the day after the expiration of Hansen’s MOU with the city signed five years and four mayors ago. 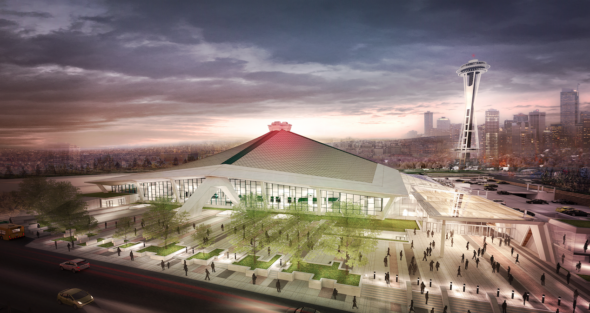 Before the vote, the council heard from 40 members of the public, the vast majority using their two minutes at the podium to heap praise on the council and OVG for the KeyArena plan. Only three or four advocated for Sodo. The day’s biggest passion came from the skateboard community, which feared the demolition of the skate park on the campus’s southeast corner without relocation would wipe out what they most value at Seattle Center. Their concerns went unaddressed in the subsequent discussion of amendments. Juarez, who said the committee had seven meetings over the past eight months, was eager to let it be known that the council had done its due diligence. “We really wanted the public to see we had experts lined up — to use a sports analogy, a deep bench,” she said, citing the presence in chambers of independent consultants Carl Hirsh of Stafford Sports LLC and David Stone, whose previous work in 2014 about the Key’s viability in a report for arena developer AECOM ignited the process. “It’s not a done deal. It’s a non-binding, proposed MOU. We have a lot of work ahead of us. As to an NHL franchise, for which OVG CEO Tim Leiweke has lined up two prospective purchasers, investment banker and University of Washington grad David Bonderman and film producer Jerry Bruckheimer, Juarez was asked if council had been guaranteed a team. “I think what we’ve learned from (consultants) and other people who are equity investors, has been very clear to us. They love Seattle. They want to have a business in Seattle. They love the whole 12th man craziness over sports. They know that this is an incredibly profitable market. I think it’s pretty glaring that we don’t have an NBA team and NHL team. People see that that’s a vacuum they want to fill. But as good investors know, there are no sure things. Even as the committee deliberated, news came from Washington D.C., that the Republican-led Tax Reform Bill passed the House Thursday. A provision in the bill eliminates the Historic Preservation Tax Credit, which OVG seeks because preserving the Key’s original roof, designated as a landmark, would mean $70 million in tax credits to the project. Hirsh confirmed to council member R0b Johnson that the proposed tax credit was 10 percent of the arena budget. If the Senate passes the reform bill into law, Johnson asked if that was an issue for OVG. Hirsh said the project partners would simply pour in more private money. No one gasped, applauded or asked for elaboration about how a sudden hole of 10 percent in the budget was no threat to the project’s financial viability. Perhaps that made more strongly Juarez’s earlier point: The Oak View crew really loves Seattle. Exhaustion. Unrelenting devilishly demanding times for our City / Region. Possibly Deborah Juarez needs a spa day ? Deborah Juarez’ response is totally unacceptable and unsatisfactory for such a critical decision with monumental consequences to NoDo/Seattle Center. A comprehensive EIS and review of the impact an overreaching, oversized KeyArena rebuild will have on such a sensitive area is not merely a nicety but an absolute necessity. Speed bumps and “vital” and “serious” obstacles were put in front of SoDo to squeeze out more information and a better deal. Everyone is tired and exhausted from the marathon arena debate; yet, KeyArena merits much more review than what it has experienced. If we lose Tim Leiweke’s offer, so be it. But let’s do this right and not resort to expediency as absured as that might seem. Other Concert Moguls are out there chomping at the bit for KeyArena. Give them a chance. I think all council members and staff resent to some degree the amount of effort that has gone into a project that is to most of them a hood ornament relative to the serious problems the city faces. The fact that Leiweke offered to help solve multiple traffic issues and keep the Seattle Center solvent was plenty enough for the council to tell him, you go, dude. Juarez’s curt dismissal, which was bluntly rude to Hansen’s efforts on behalf of the city, was a reflection of the resentment generated by Hansen’s proposal to re-purpose the Key into a non-sports, all-music venue. Leiweke’s deal will have to really go haywire for council to look with fresh eyes upon Hansen. Why would Hansen’s re-purposing proposal cause resentment? His objective is obviously to win the arena battle, so what’s offensive about proposing another option/solution their way – on his dime – that would make his offer that much more attractive? Seriously, it’s one thing for a city council to be indifferent toward sporting matters, it’s another when they display such obvious resentment. Freakin’ Seattle…. exactly right. why the resentment? it’s just business. based on what Art says, above, it was a number of reasons that caused the city to go with the Key proposal. But it doesn’t explain the rudeness and lack of clarity from the council regarding that decision. maybe that’s just their individual personalities, and it has nothing to do with Hansen. Because the city was so far down the road with OVG that they didn’t want to go back two exits and re-start. I sort of get that, although they should never have made the choice to go so far, so fast. They believed Leiweke — the NBA isn’t coming for years, and that’s true. Is she channeling her inner Trump? Blow her a little smoke and she becomes pliable. I hope this works out but given the council’s cavalier attitude about transportation in that part of town I have my concerns. See my answer above, plus one point: No one, including Leiweke and the council, knows how the opening of the new 99 tunnel in 2019, plus continued growth in the urban village around the center, will impact Center users’ movement along with neighborhood workers/businesses. It seems like the EIS isn’t going to be out of date once construction starts. Between Expedia moving in, the tunnel opening up, upzoning, the monorail and future drone use, there is a ton of moving parts that are likely going to be overlooked. All good points. There’s no one at city hall with a “SLOW” sign. Seattle’s sports fans deserve an NHL team. Seattle’s civic leaders do not. It would not surprise me one bit if Houston got the next NHL expansion team instead of us. They’ve got their ownership, political and building ducks in a row. Ours aren’t even close. I don’t know about who deserves what, but I do know that all the Canadian owners/teams want Seattle in the NHL Unless you’re calling Houston Baja Seattle. Houston has a legit hockey history (the WHA with Gordie Howe and popular minor league teams), plus the fifth-biggest US media market, a ready arena and an automatic rivalry with the Dallas Stars. The only reason they weren’t in expansion plans earlier is the mutual antagonism between Gary Bettman and the Rockets’ then-owner. Houston is the major reason why many Seattle hockey fans are all-in on OVG despite the site’s obvious drawbacks; they think if we don’t get a team in the next couple of years, we’ll never get one. If Las Vegas, of all places, could get a team before Seattle, Houston sure as heck can. Seattle has a legit hockey history too; one that includes the Metropolitans being the first American team to win the Stanley Cup. As Art stated, it’s not a question of who is more “deserving,” it’s a question of which city does the league WANT to expand to and, to a lesser extent, which ownership group excites them the most. In both of those cases, I think the answer ends up being Seattle. Not sure many folks in Seattle are still around from the Metros heyday. If you find one, please put me in touch, or at least get a photo. There is some kind of old-school mob type stuff going on deep under the layers of all of this. I can’t wait for the reveal 10, 20, maybe 50 years down the road. I’ve said it all along… someone deeply rooted in Seattle’s industrial/financial structure doesn’t like Hansen. They were never going to work with him. He was never going to get a spot at the Table of Influence. If Hansen’s original idea was to do something with Key Arena, and OVG came along proposing a Sodo site, the city would be breaking ground just south of Safeco Field right about now while holding public forums on what to do with the new swath of open space at Seattle Center created by removing the dilapidated Key. Something is rotten in Sea-town. I totally agree. Something happened to Hansen and his plan. It wasn’t just the port: that would be an easy transport fix, certainly easier than parking and access to Key Arena. Something else happened: look at the Seattle Times and its biased coverage. look at the Mariners and their small minded objections. Something happened, I tell you. I wish I knew what it was. A lot of it has been in plain sight, just forgotten. The NBA’s only interest in Hansen was Ballmer, and he left. Hansen made two mistakes with the political side: His illegal attempt to influence the Sacramento arena vote, and underestimating the degree of influence the port had with McGinn’s successor, Murray, and most council people. The other matter is that Hansen does not have the personal capital to fund the team and build the arena. He is open about the fact that he expects to be only a minority owner of team after funding arena construction. He needed the street vacation from the city to trigger investment from a much wealthier caliber of potential owners. That seemed iffy to the pols. Tim Leiweke understood that immediately and avoided uncertainty by identifying Bonderman and Bruckheimer publicly as potential NHL owners. The fact that Leiweke has been in sports for 40 years and courted commissioners and owners created cred for him among council members and staff who mostly know little about sports. Whether that charm translates into a successful remodel that satisfies the city and makes money for his investors remains to be seen. True. *shudder* … If Hansen and Ballmer “Brought Back the Sonics” together with the support of the city, Mariners, etc., from the beginning, the momentum could have worked out in Hansen’s favor, setting off a Bizarro-Seattle series of events that we can never know about. Those kids down at the Port! There’s something nefarious stewing there. Well it didn’t work out for John Creighton. The longest tenured commissioner lost his post and he’s on the record blaming Sonics fans. Look at my twitter timeline. thanks, Art. i’m sure you’re right, and thanks for re-stating the history with Hansen. it doesn’t explain the Seattle Times’s hostility, but never mind that. I might have underestimated the power of the Port, and maybe I’m over-estimating problems with traffic and parking at the Key. But as you’ve been saying consistently: where are the hard questions and vetting and skepticism about the Key arena project? I can’t help but feel like the City got rolled by a slick-talking shoe-shine-and-a-smile gladhander, all blue skies and cheerful optimism, UNTIL he gets his deal. then, we shall see. yes, we shall see . . .
You lost me at Battle of . . . The Times’ editorial page has long championed the Mariners, based on the 1930s notion that daily baseball is good for daily newspapers. Same with the print P-I bosses. If the Mariners didn’t like the Hansen plan, neither did the Times. It looks pretty badass in night time pictures of the city, however. I’m sure some photographers may agree. You know exactly what you are looking at when you see it. Its totally iconic. It’s nice that you can still see it from several vantage points, far away. I have a massively different opinion. Yes – I know it’s the Key when I’m looking at it, but don’t see much badass-edness when all I see is a roof with 4 equal pitches. Call me crazy, but the 4 pillars don’t do much for me. It looks worse the closer you get to it. So you don’t appreciate a good buttress? I kind of like the swoopiness. But I kind of like a lot of things that aren’t good for me. The city was behind it, partly because the designation would give Leiweke $70M in tax credits. Turns out the idea was so 2016, because the Trump-led GOP is attempting to kill the tax credits. Well, then. Tinfoil hat time. The NHL will give positive vibes because they’re looking for leverage to get new buildings for the Flames, Islanders, Coyotes, and Senators. I’m a bit skeptical that they’d expand again before properly exploiting those cities for public money. Moving to a brand new building is Seattle is a much more legit threat than Quebec City. While it seems inconceivable that the NHL would leave a hockey hotbed like Calgary or city the size of New York, the NBA left Seattle for OKC. Remember, pro sports owners are land barons where the valuation of the team is very dependent on their building. The teams are ancillary. The NHL and NBA are years off and being mentioned to appease the fans of sport. This is a concert venue. Seattle City Council thinks they’ve evolved passed the unwashed masses desire for pro sports. It brings in too many former loggers to their sanctum of homelessness and un-affordable housing. They don’t care. It’s been a while since you’ve attended, I see. There’s not a logger in the first 30 rows from floor, because by 2020 those seats will cost $250 per. All the Canadian owners want a team in Seattle for all the obvious reasons. The city is motivated by salvaging the Center financially with minimal public investment. It’s one less thing to worry about. Remember, the Seattle Center is a department of the city, like the fire department. Imagine what would happen if a billionaire said he would pay for the fire department’s capital and labor. I should add that I was 100% against the Tax Reform bill but now I kinda hope it passes just so OVG has to shell out an extra $70M. Won’t happen, of course – in part because the Tax Reform bill won’t pass, but also because OVG would just end up going back to the city and figuring out a way to get them to pay the $70M instead. I think the GOP bill will lose, but that doesn’t mean they won’t try again with a different color lipstick. OVG knew this was a potential outcome, but can’t do much about a proposal until it becomes law. It’s hard to say how much traffic will deter hockey fans, especially early. Every seat not taken in the first few years by local fans will be snatched up by Canadians who can’t get in to see the Canucks. They will come for the week/weekend, stay downtown and take Uber to the Key. In hindsight, I wonder if the fatal flaw in Hanson’s proposal was simply his underestimation of the importance of hockey in the equation. He wasn’t willing to put a shovel in the ground until he secured an NBA franchise – which is understandable. But if he had been willing to build as soon as he secured a commitment from EITHER the NBA or the NHL (and then put a full-court effort into securing an NHL franchise) …. maybe this would have ended up differently. Personally, I don’t think OVG cares about getting an NBA franchise or will ever do anything more than pay the idea lip service. Sure, if someone else secures a team and wants to bring them to Seattle, they’ll (probably) welcome them with open arms. But I don’t think they’ll actually make any (legitimate) effort on that front themselves. When Hansen made his MOU with the city in 2012, NBA teams were vulnerable to relocation, and he planned to be the team’s majority owner. But markets and issues changed for the NBA/NHL in ways not readily forecastable. Leiweke has claimed to offer any NBA owner equity in his building. But that’s not the same thing as control, and it isn’t worth much if the building ops aren’t profitable.